Since the beginning of 2018, the Orange County Sheriff’s Office alone has responded to more than 156 overdoses, resulting in at least nine deaths. The statistics confirm a startling trend, one which parallels reports from across the nation from law enforcement and medical examiners. In an effort to curb what is clearly a public health crisis in some communities, Orange County Sheriff Jerry Demings and Orange County Mayor Teresa Jacobs launched emergency preventive measures within one Orange County community where overdoses have been on the rise. The prevention and education outreach effort is aimed at putting lifesaving information in the hands of those who are battling addiction. “This is something that our community is experiencing, therefore this is something we are experiencing,” said Orange County Fire Rescue (OCFR) Chief Otto Drozd to more than 130 OCFR recruits and fire personnel organized on February 15. The team was brought together for a door-to-door campaign in the Holden Heights community, which aimed to provide information on how to address an opiate overdose and access treatment resources to over 7,000 residences in the area. It’s the first time OCFR Fire Inspector Chondra Hawkins, a 12-year veteran, has participated in such an effort. Hawkins, who previously lost a loved one to a heroin-related overdose, commended the grassroots operation. While many who need the department’s help think of its response in the form of lights and sirens, Hawkins believes that this type of response is just as important. Hawkins was one of 38 teams walking through neighborhoods distributing information on treatment, counseling and what to do in the event of an emergency. OCFR’s operation was in addition to emergency educational sessions which began in the Holden Heights community earlier in the week. The sessions were held at the local community center with the help of Orange County Government and Aspire Health Partners. The sessions were designed to provide a safe haven for those living with addiction and their loved ones information on how to get help, along with training and access to the emergency antidote for an opiate overdose Naloxone, also known as Narcan. According to the Orange County Medical Examiner’s Office, deaths related to fentanyl and fentanyl analogs (synthetic versions of opium – the drug found in heroin) continue to rise. Fentanyl and its analogs are significantly stronger than heroin and can increase a user’s risk of fatal overdose. In 2016, the total number of deaths attributed to fentanyl and fentanyl analogs was 87, as compared to 142 deaths between January and October of 2017. The final numbers for 2017 are pending. Individuals can obtain information on local drug treatment services by dialing 211 or online at OCFLHeroesAgainstHeroin.org. There is also a heroin toolkit available online that includes additional educational and prevention information. 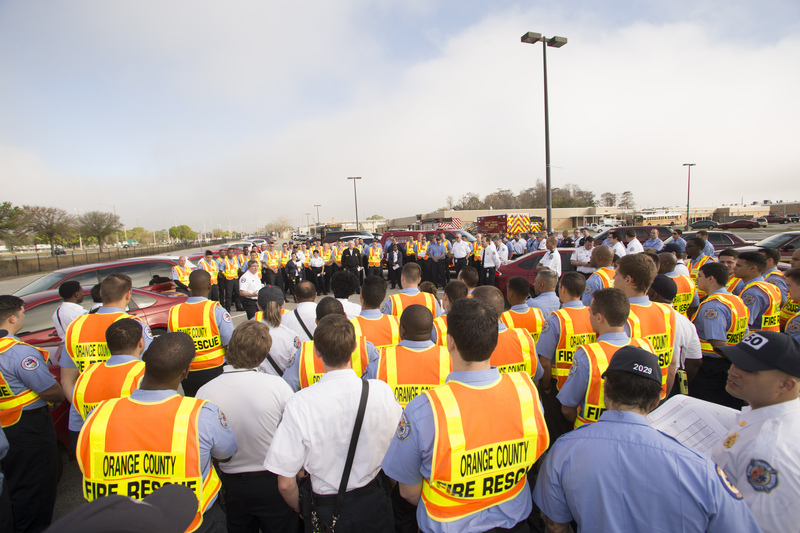 Photo Caption: Orange County Fire Rescue and personnel are briefed prior to going door-to-door to 7,000 residences in Holden Heights on Thursday, Feb 15.